Hello Open Wonderland community! I’d like to share with all of you a few new features on the Open Wonderland website that I think you might enjoy. But first, a quick introduction. My name is Evan Roth and I am a Masters of Science in Accounting student at Binghamton University in the United States. I first got involved with the Open Wonderland project through an E-Business course that I took as part of my graduate program. Since October, I’ve had the distinct pleasure of meeting with Nicole and Jonathan weekly in-world. Our meetings focus on my suggestions for implementing some changes to the Open Wonderland website in order to reach more potential Open Wonderland users and grow the community. Specifically, I’ve been working to improve the Open Wonderland website’s ranking in the various search engines, a process known as search engine optimization (SEO). There are a variety of techniques that can be used to optimize a website. I’ve worked with Nicole and Jonathan to implement a number of them over the past two months, including a relatively new technique in the SEO world referred to as video SEO. Video SEO is based on the premise that Google and other search engines often place video listings on their first page of links when they expect that videos would be relevant to a particular query. The goal of video SEO is to have a website’s video content rank on the first page in search results alongside traditional text-based web pages. Due to the nature of the project, I feel that Open Wonderland is best showcased through video. I expect that video SEO, therefore, could be an effective way to broaden the Open Wonderland user-base and expand the community. With this in mind, the first new website feature I’d like to point out is the “Video Highlights” section, located under About -> Video Highlights. There you will find a collection of some of the best videos demonstrating Open Wonderland’s unique capabilities. The videos highlight everything from interesting new modules that extend the functionality of the core Open Wonderland toolkit to some of the fascinating projects that community members are involved in that utilize Open Wonderland. The “Video Highlights” section also includes an RSS feed so that you can stay up to date with the latest Open Wonderland videos. 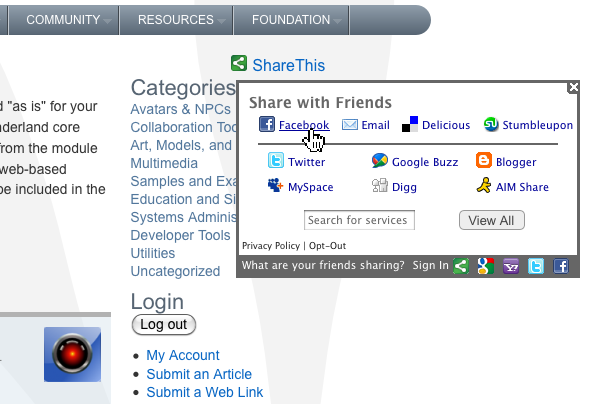 The other feature that I’m really excited about is the improved social networking integration. You may have noticed that each blog post now includes an easy way to share the post with members of various social networks that you may belong to. The same functionality is available on the video section mentioned above as well as all other pages on OpenWonderland.org. I encourage you to share your favorite content with your friends and members of the social networks in which you participate. Talk about the Open Wonderland project and about how it has impacted your work. If you have a blog, a post about Open Wonderland (including links to the site!) could alert potential new community members to the benefits of collaboration in a virtual world. Not only will you be showing members of your social network how Open Wonderland can make a difference in the work that they do, but you’ll also be helping to grow the community! You may have also noticed the Technorati code at the beginning of this blog post. It was placed there in order to submit the Wonderblog to Technorati, a search engine that indexes blogs. Being included in Technorati is just one additional way help to draw more attention to the Wonderblog and the Open Wonderland project, bringing in new users and helping to expand the community further. I hope that you enjoy using the new features that we’ve implemented recently on the site. I’ve certainly enjoyed working with everyone at the Open Wonderland Foundation and I look forward to continuing my involvement with the community. You are currently browsing the Wonderblog blog archives for December, 2010.